(Text automatically translated) It is a typical country house of 100 square meters, built in 2003, consists of kitchen, double bedroom (with cot if required), double room, a single room, bathroom with shower, veranda and shower esterna.Circondata by a hectare of olive grove, surrounded by greenery and tranquility, with all the comfort is quite isolated, but at the same time not far from the town (it is a small village, called Sos Alinos, with pharmacy, medical, church, bar , shops, restaurants, hotels, etc..). The famous beaches of Cala LIBEROTTO 2 km away (3 minutes by car), are located near the beaches of Sa Curcurica of Linnas Siccas and the natural park of Orosei Bidderosa.Il village (6000 inhabitants), which is part of this area, is 11 km away. Please note that the final price of the rent you have to add 50 euros for final cleaning. "After an amusing telephone call with the kind owners, with much giggling about our limited command of the Italian language and theirs of the English, we met the owners at an easy to find petrol station and were then guided to the holiday home. The house was situated in a small, quiet olive tree orchard, with a lovely view on the hills. The accommodation was basic but comfortable and clean. The village's centre, with a.o. supermarkets and pharmacy, were on walking distance from the house. Lovely beaches were only a few minutes' drive away. At night we enjoyed the crickets and the beautiful starry sky. To our opinion this holiday home is an incredible value for money." "We visited this house in the first half of September with our 2 children (4 and nearly 3). For us it was pretty much perfect. The house was clean and had all the equipment we needed, it felt easily big enough for us, particularly as we could use the large outside terrace as our living room. The children really loved the place, particularly the garden and our friendly local lizards. We always felt safe for them to be outside as the house is set a long way back from the road. The little shopping centre in Sos Alinos is an easy walk and has a supermarket, baker, greengrocer and butcher. It's about a mile to Cala Liberotto where you can find a nice beach as well as bars where you can relax with a drink or an ice-cream, also at least one pleasant restaurant overlooking the beach. I would thoroughly recommend this place for anyone looking for a quiet holiday visiting the local beaches or mountains, particularly if they have small children. Our hosts Tomaso and Rosa were really friendly and helpful, and we managed fine despite them speaking little English and us speaking almost no Italian." "Great location, quiet and beautiful place to stay, and very convienient for exploring the region . very friendly and pleasant owners who kept leaving us baskets of lovely fruit and some wine and oil. 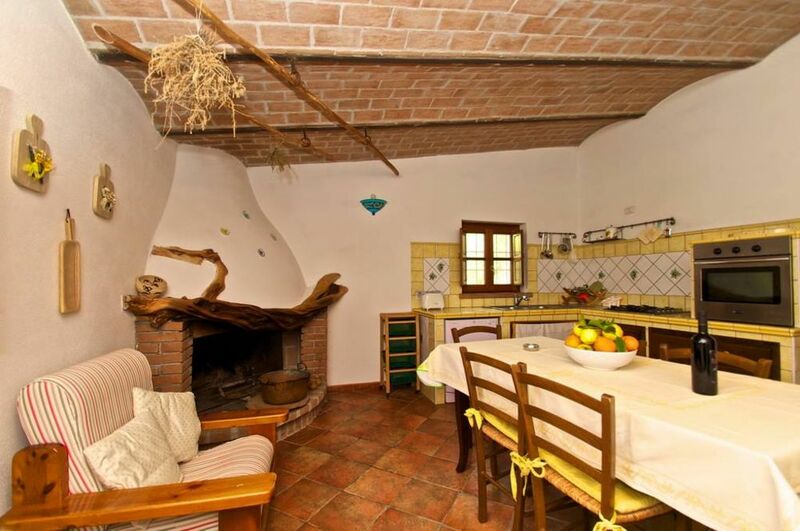 living room on the small side, but otherwise house very good, very clean and in lovely meadow/olive grove. we had great evenings eating outside enjoying our surroundings. The children adored the garden." We enjoyed our stay in Tomaso’s villa very much. The build quality is very good and it looks even better than in the photographs on the web site. It is sited in a small olive grove on the edge of a village a few miles north of Orosei. Tomaso and his family are delightful and were very helpful. The area has some beautiful beaches and the family showed us the best ones near the villa. There are a selection of restaurants and supermarkets locally. The area is surrounded with spectacular mountains with some superb scenic drives just a short distance away. We would thoroughly recommend a visit to Tomaso’s villa and the surrounding area. Es ist sehr stil- und liebevoll eingerichtet, vom Kamin über die Lampen bis zu den Möbeln alles sardisches Handwerk, herrlich! Tolle Strände in fünf Minuten Entfernung und viele tolle Ausflugsziele im Umkreis von 50 Kilometern. Tomaso macht selbst Rotwein und Olivenöl! Für uns war das ein tolles Zuhause in unserem Sardinien-Urlaub. Mitten in Olivenhain gelegenes Ferienhaus in absoluter Ruhe. Alles sauber angetroffen. Alle Geräte wie Waschmaschine, Spülmaschine, Fernsehen funktionieren. Vermieter super nett.....Schlüssel übergeben....bei Abreise Schlüssel abgeholt.....sonst nie gesehen. Perfekt für Familie....auch wenn man mit zwei Familien anreisen will. Im Anschluss ist ein weiteres Ferienhaus in gleicher Ausstattung. Alles so gelegen,das man sich nie auf die Nerven geht. Im Ort alles,was man für den Einkauf braucht. In der Summe hoch empfehlenswert! (Text automatically translated) It is accessed by ss 125, after leaving the town of Sos Alinos. (Text automatically translated) you need the car.